The FIAT G.50 Freccia (English: "Arrow") was an Italian fighter aircraft of World War II. It was the first Italian low-wing monoplane fighter with enclosed cockpit and retractable landing gear to go into production (without the enclosed cockpit though, as Italian pilots felt uncomfortable with it). It was also used in small numbers by the Finnish Air Force. The Fiat G.50 Freccia ("Arrow") was a World War II Italian fighter aircraft. First flown in February 1937, the G.50 was Italy's first single-seat, all-metal monoplane  with an enclosed cockpit and retractable landing gear to go into production. Pilots disliked the sliding cockpit canopy, which was not easy to open quickly and interfered with vision, so in later production series, an open cockpit was adopted. In early 1938, the Freccias served in the Regia Aeronautica including with the Aviazione Legionaria in Spain, where they proved to be fast  and, typical of most Italian designs, very manoeuvrable, however, the aircraft had inadequate armament (two Breda-SAFAT 12,7 mm machine guns). The Fiat G.50 was also used in small numbers by the Croatian Air Force and 35 were flown to Finland where they served with distinction. The Fiat G.50 was designed by Giuseppe Gabrielli, who started design of a single-engined monoplane fighter in April 1935. Production started in mid-summer 1936. Construction was entrusted to the workshops of CMASA (Costruzioni Meccaniche Aeronautiche S.A.) at Marina di Pisa. The prototype first flew on 26 February 1937, with Comandante Giovanni de Briganti at the controls. In his first flight, de Briganti reached a top speed of 472 km/h and managed to climb to 6,000 meters in 6 minutes and 40 seconds. The G.50 was the first front line Italian monoplane fighter with retractable undercarriage, and with these improvements, its maximum speed was 33 km/h (21 mph) faster than its contemporary, the biplane Fiat CR.42. Both types were powered by the 626 kW (840 hp) Fiat A.74 RC38, 14-cylinder, air-cooled radial engine. In 1937, along with the first pre-series machines, a Gruppo sperimentale was formed. The first versions could have different armament: one or two 12.7 mm (.5 in) Breda-SAFAT machine guns on the nose and two more 7.7 mm (.303 in) Breda-SAFAT in the wings. Later versions were also distinguished by a larger rudder. In September 1937, Fiat received a first order for 45 aircraft. Before a larger order was placed, the Air Ministry decided to hold a comparative test with the new Macchi MC.200. On 20 October 1937, Comandante Giovanni de Briganti, Chief Test Pilot of the Fiat G.50 program, was killed on the sixth evaluation flight of the second prototype (M.M.335) when the aircraft did not recover from a high speed dive. At Guidonia, flight tests showed the aircraft easily entered into autorotation (uncontrolled spinning), a highly dangerous trait especially at low level, where recovery was impossible. During a visit by Italian King Victor Emmanuel III and Prime Minister Benito Mussolini, another tragedy occurred in Guidonia. While performing a low, fast pass, three G.50s flown by the experienced pilots, Major Mario Bonzano and Lieutenants Beretta and Marasco encountered difficulty. Beretta's aircraft spun uncontrollably and crashed into the ammunition laboratory, killing the pilot. Despite the crashes, flight tests were satisfactory and the "Freccia" proved to be more maneuverable than the faster Macchi MC.200 which was declared the winner of the Caccia I ("Fighter One") competition on 9 June 1938. On account of its maneuverability, the Regia Aeronautica Commission decided to order the Fiat as well, while the third participant aircraft, the IMAM Ro.51, was rejected. In early 1938, the first examples were delivered to the Regia Aeronautica. Italian pilots did not like the enclosed canopy because it could not be opened quickly and as it was constructed from plexiglass of very poor quality prone to cracking, limiting visibility. Consequently, in the second batch of 200 machines, an open cockpit was installed. After 1939, the main production was shifted to the CMASA factory in Marina di Pisa, Tuscany. In 1938, the Regia Aeronautica requested a two-seater trainer which was designated the G.50/B (Bicomando Bc.). The first were built in the second half of 1939. The student pilot sat in the front in a closed cockpit with two roll bars. The first five aircraft were part of the 1a serie ("first series"). Successive production was entrusted to CMASA who completed 106 G.50/Bs. A G.50/B was later transformed into a reconnaissance aircraft, equipped with planimetric camera. Another G.50/B was adapted with a hook to operate as a naval reconnaissance aircraft intended for the aircraft carrier Aquila, which was never completed . In September 1940 a slightly improved version appeared, the G.50 bis. Its main advantage was extended combat range due to an additional tank of 104 litres (27 USgal), increasing range from 645 km to 1,000 km. The last version was the G.50/V (Veloce) built in mid-1941 by CMASA, equipped with a DB.601 engine of 1,075 CV. During tests at Fiat Aviazione's airfield in Turin, it reached a top speed of 570 km/h in level flight and managed to climb to 6,000 meters in 5 minutes 30 seconds. Nonetheless, Gabrielli had already designed the Fiat G.55 and Fiat had already obtained the licence to build the 1,475 CV Daimler Benz 605, so the G.50/V was used for tests with new equipment and then was scrapped. Total G.50 production was 784 aircraft, 426 built by Fiat Aviazione and 358 coming from CMASA. Exports included 58 G.50s: 13 to Spain, 35 to Finland and 10 to Croatia. 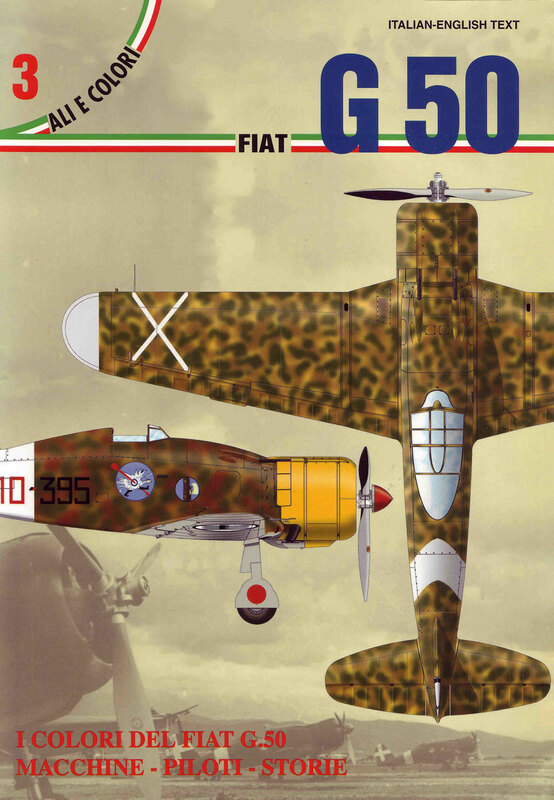 In 1938, the first operational Fiat G.50 aircraft were delivered to the Regia Aeronautica. During the Spanish Civil War, about a dozen G.50s were sent to Spain to reinforce the Aviazione Legionaria. The type proved extremely maneuverable, it was one of Italy's best fighters, yet by the time World War II began, it was considered to be underpowered and underarmed. There were 118 G.50s available when Italy entered World War II (97 in front line duty), most assigned to the 51° Stormo based in Ciampino airport, just outside Rome and in Pontedera, with 22° Gruppo of 52° Stormo. On 10 June 1940, when Italy declared war against France, 22° Gruppo G.50s went into action, followed by the 48 aircraft of 20° Gruppo. The experiences of the early series G.50s over Britain showed the inadequacies of the type. Its operations were almost useless in the campaign because they were too short-ranged and stationed too away from England. The G.50s had limited endurance, with missions rarely exceeding one hour. The G.50bis with larger fuel tanks was already in production, but it was not sent to 20° Gruppo in time. Performance was also lacking; when 22 Fiat G.50s intercepted several Hawker Hurricanes on 5 November 1940, the RAF fighters easily escaped. On 21 November, when a Bristol Blenheim attacked the Medgelem airfield two G.50s scrambled, but lost the bomber in the clouds. On 23 November, G.50s followed four Hurricanes, but were unable to close on them. Another fruitless intercept took place on 31 January, when G.50s lost a Blenheim that escaped into the clouds. The last sighting of enemy aircraft (fighters) occurred on 8 April 1941, when, once again, the elusive targets were not intercepted. The G.50s were early models with an open canopy, useful in Mediterranean climes, but the pilots suffered heavily in the bad weather of northern Europe. The aircraft was also under-equipped, with a mediocre radio set (powered by batteries, prone to freeze at altitude) and lacking any armour protection. [N 2] In Belgium, 20° Gruppo had the opportunity to see the Bf 109 in action with several G.50 pilots trained to fly the type with two Bf 109Es sent to the Gruppo in mid-January 1941. The G.50s returned to Italy and later the 20° Gruppo had the G.50bis that had the endurance required for operational missions utilizing an extra fuel tank in the internal fuselage section originally configured as a bomb bay, but this series was primarily utilized over Africa. In the second half of the war, the G.50 operated as a multirole fighter/ground attack aircraft, with external bombs only. During the opening phase of the Allied invasion of Sicily, the G.50 was the most numerous aircraft used by the Regia Aeronautica to counter attack the Allied landings. Just before the invasion, the Regia Aeronautica moved to Southern Italy. 50° Stormo Assalto, a specialized ground attack unit was equipped with Fiat G.50bis fighter-bombers. As soon the invasion started, on 10 July 1943, further units were rushed to the area. With other Italian and German ground attack units, 45 Fiat G.50bis of 158° and 159° Gruppi Assalto, from Pistoia  were committed to attack ships, landing craft and troops. On 11 July, 10 of them were in action with Re.2002s (escorted by five Re.2005s of 362a Squadriglia), when they were intercepted by an overwhelming fighter "umbrella". Three G.50s were shot down, including Tenente Colonnello Guido Nobili, commander of 5° Stormo Assalto. The remainder landed on an airfield but were destroyed by an incoming air attack. By the time of the Italian Armistice with the Allies, only a few G.50s were left in Italian service. Some were used as part of the Italian Co-Belligerent Air Force, while four others were used by the Aeronautica Nazionale Repubblicana as fighter trainers. The top scoring Italian pilot in a Fiat G.50 was Furio Lauri, who was credited with 11 "kills" before the end of 1941 with a final score of 18. An Italian Fiat G.50 captured by the British at Sidi Rezegh airfield in North Africa. Note the RAF Hawker Hurricane landing and in the right background. The first 27 Fiat G.50s, belonging to Squadriglie 150a and 152a from 2° Gruppo Autonomo C.T., arrived in Libya on 27 December 1940, operating from Brindisi and Grottaglie airfields. They flew their first combat mission on 9 January 1941 when Capitano Pilota Tullio Del Prato (already known to have been a Reggiane Test pilot), Comandante of 150a Squadriglia encountered a Hawker Hurricane Mk I on the front line that attacked him, forcing the Fiat to crash-land in the desert. On 25 January 1941, a new unit, 20° Gruppo Autonomo C.T., with 351a, 360a and 378a Squadriglie, commanded by Maggiore pilota Pietro Bianchi, arrived in Libya, with 31 brand new Fiat monoplanes. 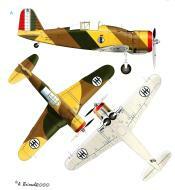 On 27 May, 20° Gruppo was reinforced by 151a Squadriglia, equipped with the new Fiat G.50bis version. Caught up in the chaotic retreat of Italian army in the winter of 1940–41, the Fiat G.50s saw little action. In Africa, although the G.50s were mainly outperformed, G.50 pilots sometimes managed to shoot down the faster and better armed Hurricanes and P-40s. G.50s were faster than biplanes, as showed in 1939 air exercises, so they could be useful against British bombers, even if their armament was relatively weak and often insufficient to shot down their target. By that time, the G.50s in North Africa were the better -bis version which, although heavier,had almost two hours of flight time as a result of the extra fuel carried. The G.50s did not carry bombs, but used HE and incendiary bullets. Their usual tactic with the G.50 was to dive from 1,500 meters but the type never flew very high over Africa, with the usual ceiling not exceeding 4,500 m. The aircraft were still lacking radios and the desert sand, despite their air filter, could cut the engine lifespan to only 70–80 hours. In the hands of expert pilots, the Fiat G.50 could score multiple kills in a single action. On the evening of 9 July 1941, Sergente Maggiore Aldo Buvoli of 378a Squadriglia, 155° Gruppo Autonomo, took off from Castel Benito airfield to patrol Tripoli harbour, and duly intercepted seven Blenheim light bombers that were performing a low-level attack on the ships. The Blenheims were already being pursued by two Fiat CR.42 biplanes from 151° Gruppo when Buvoli attacked the bombers shooting at each of them, in sequence. One Blenheim ditched in the sea while another was shot down a few miles north of Tripoli. Two more Blenheims never returned to Luqa airfield in Malta and were posted as missing. For these successes Buvoli was awarded with the Medaglia d'argento al Valor Militare and was subsequently credited with four kills, No. 110 Squadron RAF reported the loss of a similar number of Blenheims IVs on its very first mission since arriving in Malta from UK in early July. One of the units fielded by the Regia Aeronautica was the 155° Gruppo, based at Derna airfield. One of the few first claims by "Freccias" pilots was on 9 April 1941, when Tenente Pilota Carlo Cugnasca (an expert pilot, and the first one to deliver a G.50 to Finland), attacked three Hurricanes Mk Is from No. 73 Squadron RAF, claiming one although this air victory was not confirmed. On his return, he was forced to crash-land his G.50, flipping over on the airstrip, but remaining unharmed. At low level, the clashes were often confused and with unpredictable effects. Tactical surprise was often what made the difference, as the next battle showed. Cugnasca was still in action on 14 April when 66 Axis aircraft attacked Tobruk. They were mainly Ju.87 Stukas (42 from Lutftwaffe III./StG 1 and II./StG 2, and seven from 96° Gruppo), escorted by eight G.50s (155° Gr), four C.R.42s (18° Gr) and five Bf 110 (III.ZG 26). The defenders of 73 Sqn RAF were outnumbered. RAF Hurricanes had to ignore the Axis fighters and concentrate on attacking the bombers as the Stukas were the greatest threat, being such precise and lethal machines. Cugnasca and Marinelli attacked H.G. Webster, when he was shooting at a Stuka. Hurricanes with Stokes air-filter were only marginally faster than a G.50, so Webster was followed and finally shot down and killed (Hurricane V7553) over Tobruk. "Smudgeon" Smith, a Canadian ace (with five victories) saw what was going on, and attacked both Cugnasca and Marinelli, shooting down and killing them. Finally, Smith attacked and damaged another G.50, but commander Fanello saw him and saved the third G.50, surprising and shooting down Smith. That day was a draw, with two G.50s and two Hurricane lost. Both Smith and Cugnasca were well known and respected, so it was also a heavy human loss for both sides. G.50s operated from Martuba airfield with the first attack over Sidi el Barrani airfield made seven days later. On 4 July 1941, six G.50s attacked again, strafing aircraft and ground equipment. The worst day for the G50s was during 'Operation Crusader'. On 18 November, the Desert Air Force destroyed 13 aircraft on the Ain el Gazala airfields; 10 of them were G.50s. On 19 November, 20° Gruppo based at Sid el Rezegh suffered heavy losses when British armoured forces (40 Crusaders of 6th RTR and several units of 3rd Brigade, South African Regiment, both part of 7th Armoured Brigade) suddenly attacked the airfield. Of the 19 G.50s, only three escaped whilst 80 pilots and ground crew were taken POW. In only two days, Regia Aeronautica lost 34 aircraft. In total, G.50s losses were no less than 26, and the 20° Gruppo was almost destroyed, since it had only 36 G.50s with 27 of them serviceable. Tente Col Mario Bonzano, commander of 20° Groupo, was among the captured, while his vice, Furio Niclot Doglio, was almost shot down since he was not aware of the British operation. Several G.50s were captured almost intact and at least one was taken by No. 260 and later passed to No. 272 Sqn. After 1941, G.50s played a minor role in the Regia Aeronautica. In June 1942, British intelligence estimated the 12° Gruppo having 26 G.50s (10 serviceable), while the backbone of 5a Squadra Aerea were 104 C.202s, 63 C.200s, 32 Z.1007 and 31 S.79s. After the Italian declaration of war against Greece, the Freccia began operations on 28 October 1940 in the Balkans and Aegean Sea theater. The 48 I^ serie G.50s were from 24° Gruppo (Squadriglie 354 and 355, based at Berat) and 54° Gruppo (Squadriglie 361 and 395, based at Devoli). The 2° Gruppo, commanded by Maggiore Giuseppe Baylon (Squadriglie 150 and 152) with a mixed component of 12 Fiat monoplanes and CR.32s was based on Bari-Grottaglie airfield. During the Greece campaign, adverse weather conditions hampered the air operations for most of the time; but nevertheless, there were several days in which fierce battles were fought, often with a large amount of overclaiming made by both sides. Early on 20 February 1941, Hawker Hurricane fighters were engaged in their first aerial combat over the Balkans when seven 54° Gruppo G.50s were scrambled from Devoli to intercept a formation of RAF bombers with their Hurricane escorts. A few days earlier, a British cargo ship had delivered six Hurricanes and several Wellingtons to Paramythia and these few aircraft boosted the RAF power in the region. "Freccias" claimed a bomber and a fighter while the British claimed four G.50s. On the same day, in the afternoon, 15 G.50s engaged a large mixed formation of RAF Gloster Gladiators claiming 10 aircraft for the loss of one Fiat. RAF claimed three G.50s without any losses. Postwar records showed only a Bristol Blenheim and a G.50 lost for the day. On 28 February 1941 another massive air battle had RAF units intercepting Italian bombers and escorts, claiming five BR.20, three Sm.79s, 13 CR.42s and six G.50s, plus several others damaged. Italians claimed six Gladiators and one Spitfire. The recorded losses were one Gladiator (No.112 Sqn) and eight Italian aircraft, included two G.50bis (24o Gruppo) and four BR.20s (many more were damaged). After this aerial battle, the Regia Aeronauticawas no longer effective in the theatre. On 4 March 1941, a Fiat G.50 bis shot down the Hurricane V7288 of Australian RAF ace Flight Lieutenant Nigel "Ape" Cullen (credited with 15/16 victories) off Valona coast (Albania), while he was flying as wing-man for ace Marmaduke "Pat" Pattle. In the Greek campaign, the Fiat losses of 10 fighters included combat losses and others destroyed in accidents and in the bombing of Italian airfields. Germany hindered the transit of the aircraft, consequently, the Fiats were disassembled and embarked in La Spezia on the Norwegian ship Braga, that set sail on 20 January, bound for Turku, Finland. Due to this delay the first Fiat fighters did not reach HLevLv 26 at Utti, until February 1940, too late to affect the course of the winter battles that year. The first kill was achivied on 26 February. The Fiat fighters saw little action although on 27 February 1940, Lieutenant Malmivuo was the first Finnish pilot to be killed in a G.50 (FA.12), when his fighter crashed after a combat with Soviet aircraft. At this stage, Finnish pilots preferred the Hurricane, the French Morane-Saulnier M.S.406 and even the Brewster Buffalo to the Fiat G.50. Overall, HLeLv 26 achieved 11 kills vs one loss (plus another in an accident, as there were two Finnish pilots killed). Freccia's were numbered FA-1/FA-35, but it seems that only 33 were delivered (13 in February, 17 in March an one in June). The G.50s were taken from the 235 made by CMSA, both Serie I and Serie II aircraft but all had the open cockpit of the Serie II, a feature that Finnish pilots didn't like, especially in the winter. There were some attempts to improve the aircraft; one was tested with an enclosed cockpit, another with a D.XXI ski-undercarriage, but none of the modifications were accepted in service. Better protection for the propellers (with problems at extremely low temperatures) and few other changes were introduced. The speed of the Finnish G.50s was around 430–450 km/h, much lower than the standard series could achieve. The first demonstration of the Finnish Air Force's effectiveness came on 25 June 1941, thanks to the Fiat G.50 fighters from HLeLv 26, downing 13 out of 15 Soviet SB bombers. A total of 13 aerial victories were achieved, with Captain O. Ehrnrooth, Lieutenant Olli Puhakka and Sergeant L. Aaltonen being the most successful Fiat pilots with two victories each. During the Continuation War, the Fiat fighters were most successful during the Finnish offensive of 1941, after that they became increasingly less effective. 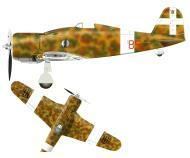 In 1941, the Fiat squadron, LLv 26, claimed 52 victories against the loss of only two fighters. The Soviets were able to bring better, newer fighter types into the front lines during 1942 and 1943, while the Fiats were becoming old and run-down, and the lack of spare parts meant that pilots were restricted to only a minimal number of sorties. Nevertheless, between 30 November 1939 and 4 September 1944, HLeLv 26's G.50s shot down 99 enemy aircraft, shooting down more modern aircraft, such as the British fighters sent to the USSR. 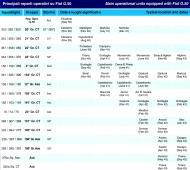 In the same period, Finnish squadrons lost 41 aircraft (12 were G.50s) and 10 more lost to flak and non combat causes, including Bulldog IIAs, Fokker D.XXIs, Gloster Gladiators and Brewster B-239s. The most successful Fiat G.50 fighter pilots were O. Tuominen (23 victories with G.50s), Capt Risto O. Puhakka (11), N. Trontti (six), O. Paronen (four), U. Nieminen (four) and L. Lautamäki (four). The Finnish Fiats were finally phased out of front line duty in summer 1944. They were not more than 10-12 and, even as trainers, they did not last long, since they lacked spare parts. Unlike the older MS.406, there was no effort to change their engine to make them better and faster, and it is probable that at the end of the war they were already phased-out. In October 1941, the Croatian Air Force Legion requested military aid from Italy and Italy agreed to deliver 10 Fiat G.50s (nine single seaters and one two seater) along with ancillary equipment. On 12 June 1942 the Fiat G.50bis fighters took off from Turin-Fiat Aviazione for Croatia, but before they reached the border were stopped by an order from Capo di Stato Maggiore Ugo Cavallero, who feared that the Croatian pilots would defect. The G.50s had to wait until 25 June before being delivered to the Croatian Air Force. and were then allocated to the 16th Jato at Banja Luka  and were intensively used until 1945 against Yugoslav Partisans, at first in Bosnia and Herzegovina, then in Serbia, Croatia and Dalmatia. During 1942, a Croatian G.50bis squadron was transferred from Northern Yougoslavia to the Ukrainian Front, flanking the 4th Luftflotte. On 25 June 1943, the Zrakoplovstvo Nezavisne Drzave Hrvatske (ZNDH), the Air Force of Independent State of Croatia, received nine G.50bis fighters and one G.50B. In October while based at Zaluani airfield, Banja Luka they flew many strafing missions against partisans for nearly a year. After the Italian armistice of 8 September 1943, the Luftwaffe supplied the Croatian Air Force Legion with 20 to 25 Fiat G.50s captured on Regia Aeronautica airfields in the Balkans. These equipped two Croatian fighter units. but by the end of 1943 only 10 remained. Three G.50s captured after the Armistice were loaned to Kro JGr 1 at the beginning of 1944. In 1944 some of the G.50s were operated at the Brezice training school until 1945, when they were captured by Yugoslav Partisans. Postwar, the Fiat G.50s were used for some time by the newly formed Yugoslav Air Force (SFR), the last G.50s in active service. Currently, the only known G.50 bis still in existence is undergoing restoration in the Museum of Aviation, in Surčin, at Nikola Tesla Airport, Serbia. G.50 bis: Development of the G.50 version with extended range, 421 built. G.51 Projected production version of the G.50V, abandoned infavour of the Fiat G.55. G.50ter: One aircraft powered by a 1,000-hp (746-kW) Fiat A.76 engine, one built. G.50V: One aircraft powered by a Daimler-Benz DB 601 engine, one built. G.50bis A/N: Two-seat fighter-bomber prototype, one built. Croatia: Air Force of the Independent State of Croatia received 15+ aircraft. Finland: Finnish Air Force received 35 aircraft which served with LeLv 26 No. 26 Squadron. Yugoslavia: SFR Yugoslav Air Force 1 ex-Croatian. Fiat G.50 B, MM.6316, of 2a Sezione Addestramento Avanzato, Scuola Caccia (Advanced Fighter Training Flight), Aeronautica Nazionale Repubblicana, Torino-Caselle, January 1944. Three-tone camouflage scheme with Green and Brown blotches over Sand background and Light Grey lower surfaces. White trainer bands around wings showing hastily applied German crosses superimposed. After the armistice the German seized more than forty G.50s and a dozen of two-seaters on many Italian airfields, incorporating them into the Luftwaffe after a rapid change of markings. Early in 1944, when the ANR structure was consolidating, the Luftwaffe handed over some G.50 to Sezione Addestramento Avanzato Caccia, based at Caselle and led by Captain Cesare Balli. This aircraft still retained the German markings, later to be exchanged for new national ANR markings. Fiat G.50 B, MM.6843, of 3a Squadriglia, 2° Gruppo Scuola Volo, A.M.I., Brindisi, 1946. Overall aluminium finish with six green-white-red roundels on wings and fuselage. Spinner was red and serial black, as was the small individual code carried aft of the fuselage roundel. Note the cowling had gun fairings, as it was evidently coming from a single-seater. Only five G.50s were taken in charge by Regia Aeronautica after the armistice, and the last one in flying conditions was rebuilt by the S.R.A. (Aircraft Repair Unit) at Lecce and assigned to 1a Squadriglia of Scuola di Pilotaggio (Basic Flying School) at Leverano. When the school was transferred to Galatina on 1 November 1945 to be reorganised, the only G.50 was assigned to 3a Squadriglia of 2° Gruppo Scuola Volo (Advanced Flying School), being used for basic monoplane training after pupils got their aerobatic biplane training on CR.42s. On February 1946 the group moved to Brindisi and the G.50 still performed the same role till the end of 1947. Another Fiat G.50 B, with standard three-tone camouflage and white trainer bands, was belonging to the Castiglione del Lago Fighter School, even if detached to Berat, Albania, with the 154° Gruppo C.T. in february 1941. This Group was formed in Albania in October 1940, operating against Greece and receiving G.50s, whose handling characteristics could create major operational problems to many pilots fresh from the schools. Consequently, the Air Ministry requested the use of two-seaters was not limited to flying schools, but extended in stead to first line units, when re-equipping on with new monoplane fighters. Prototype Fiat G.50 B, MM.3615, first flown by Ezio Guerra, Pisa S.Giusto, 30 April 1940. Three-tone camouflage scheme with Green and Brown blotches on Sand background and Light Grey lower surfaces. In order to solve the training problems due to different handling techniques of new heavy wing- loaded monoplane fighters, the Air Staff requested a double command trainer version since February 1938. reserving to that type the last five serials of the first production order. Consequently, Fiat evolved the G.50B unarmed trainer version, having a second cockpit “in lieu" of the fuselage fuel tank, and the range reduced to fifty percent. Overall wing and fuselage dimensions of the single-seater were retained. However, the first aircraft could eventually fly only on April 1940, when it was test flown at Pisa. Later, a total of 100 aircraft of this version were built by CMASA, remaining the only monoplane two-seater trainer produced in Italy. Fiat G.50 B, MM.6425, of an Advanced (2° Periodo) Flying School on 1941. Three-tone camouflage scheme with Green and Brown blotches on Sand background and Light Grey lower surfaces. White trainer bands around wings and yellow nose band. A very high individual code, typical of school units, was painted black (or possibly red) on the white fuselage band. Fiat G.50 illustrated, MM.4744, was in force to a training unit in 1942, having a Dark Olive Green overall scheme and Light Blue-Grey lower surfaces. It was another old, second series aircraft, later repainted in a scheme adopted in the second part of 1941. This time, overhaul should have been carried at CMASA, as the original tail cross design was retained and the company trade mark was unusually added under military serials. Late in 1942 the quantity of G.50s in force with all training units had reached 185 aircraft. Fiat G.50 bis of 3./Jagd Geshwader 108, Luftwaffe, Wiener-Neustadt, July 1944. This aircraft retained an Italian overall Dark Olive Green camouflage, with Light Blue-Grey lower surfaces. Some area on fuselage is showing traces of being repainted with a darker colour. This unit used distinctive large white codes on cowling, of very unusual design for a Luftwaffe unit, resembling more an American stencil type. The same individual code was also repeated in small white letters, irregularly traced in the lower fuselage near the cockpit. Jagdgeshwader 108 (formerly Jagd Fliegerschule 8) was a major German G.50 user, being equipped mainly with Italian types, among them CR.32s, CR.42s, G.50, C.200s, C.202s and C.205s. Other German units using the Fiat G.50 were Fliegerflugschule 123 A (No. 123 Basic Flying School) and Schulungjagdgeshwader 101. The Luftwaffe used a rough total of forty G.50s, loosing 12 of them for many reasons, including break-downs, flight accidents and enemy actions. Wiener Neustadt East Airport is an airport serving Wiener Neustadt, a city in the Austrian state of Lower Austria. Fiat G.50 bis of Jagd Geshwader 107, Luftwaffe, Toul, January 1944. This aircraft retained the original Italian Green lizard camouflage, displaying many traces of repaint with German colours, probably RLM 75 and 76 greys. The broad yellow band on fuselage and a very high individual number are typical of this school. 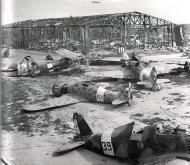 After the Italian armistice many Italian aircraft were seized by the German and taken in force by their schools. Some German flying school was then based in France, considered a restful area far from the front, at least till the Allied landed in Normandy. Jagdgeshwader 107, until January 1943 known as Jagd Fliegerschule 7 (No.7 Fighter School), used many German and captured French trainers at Toul and Nancy airfields. As from January 1944 they used also several Fiat CR.42s and a few G.50s. In May the school was transferred to Markensdorf, Austria, due to increasing Allied raids on France. Fiat G.50, MM.3602, of a training unit in 1941. Three-tone camouflage scheme with Green and Brown blotches on Sand background and Light Grey lower surfaces. The cowling band was yellow on this first production batch aircraft, later improved to following batches standard. Note the Venturi placed on an underwing position as on Bis-type machines, and the new livery, using late-production colours, probably applied during a major overhaul, with a non standard tail cross design and a lower colour demarcation line going up to meet tailplanes. Fiat G.50. MM.5452, shown in the lower profile, was probably in charge to a Gruppo Complementare (Operational Conversion Group) in 1942, with a Dark Olive Green overall scheme and Light Blue-Grey lower surfaces. It was a fourth series aircraft, later repainted using the colours prescribed by new camouflage specification of Summer 1941. Even this tail cross was of non standard design, with serials painted light blue. The first Fiat G.50 prototype, MM.334, as first flown at Turin on 26 February 1937 by CMASA’s chief test pilot Giovanni De Briganti. Aircraft finish was Pale Ivory (Cachi Avorio Chiaro) overall, with black wing national insignia painted on white roundels in four positions and a red trim on the fuselage sides. A multicolour ‘fascio’ carried under the cockpit and green-white-red rudder stripes completed the markings. The military serial (Matricola Militare), retrospectively assigned in June, was later painted black under the model designator. In fact, the prototype was initially developed as a private venture by Fiat-Aeritalia well before the Air Ministry issued in 1936 a specification for a monoplane interceptor. It was built by CMASA, a subsidiary company, and was later sent to Guidonia Experimental Centre for military evaluation. The original configuration did not include the armament, while adopting a distinctive cask-like cowling, giving the aircraft its typical high-speed plane look, even more evident due to a ‘sporty’ colour scheme. First Fiat G.50 prototype, MM.334, 2nd International Aeronautical Exhibition, Milan, October 1937. After initial test flights the prototype showed some improvement, mounting a cylindrical cowling with cooling gills and a new increased span wing with redesigned ailerons. Armament, consisting in two machine guns, was also installed, while aircraft was camouflaged in a three-tone splinter scheme using same colours - Sand (Giallo Mimetico 1), Green (Verde Mimetico 1) and Brown (Marrone Mimetico 1) - as already used at the time at Fiat on the CR.32s. Lower surfaces were Light Grey (Grigio Mimetico). National insignia was painted black on white wing roundels, completed by a fuselage colour ‘fascio’ and green-white-red rudder stripes. The previous red flash on fuselage had been replaced by a noseband, almost certainly red, later removed just before the exhibition in Milan. Second Fiat G.50 prototype, MM.335, Guidonia, September 1938. This machine was first flown at Pisa on 20 October 1937, crashing on 8 November during its sixth flight, and killing De Briganti. Consequently, as the prototype could not be delivered to the Air Force, a third aircraft with the same serial number replaced it for military evaluation. External finish was aluminium overall with black wing national insignia on white roundels. A simple red trim was carried on the fuselage sides, while the usual colour ‘fascio’ was not carried. A quite evident MP lettering painted in a black circle identified the manufacturer, namely the CMASA Company of Marina di Pisa. Standard tricolour rudder stripes and black serials completed the markings. A part from mounting main landing gear covers, a faired tail-wheel, metal rear canopy fairing, and ballanced ailerons, this aircraft was essentially similar to the first prototype, incorporating also all kind of modification previously experimented on it. Fiat G.50, MM.3574, having a three-tone camouflage scheme with Green and Brown blotches on Sand background and Light Grey lower surfaces. White broad trainer bands wrapping around wings. This was another old aircraft, being actually the fifth aircraft produced of first production batch, later retrofitted with an open type canopy, a metal tail fin and a balanced rudder. Prototype Fiat G.50 O/R, MM.5988, Stabilmento Costruzioni Aeronautiche (Aircraft Manufacturing Factory), Guidonia, 1942. Three-tone camouflage scheme with Green and Brown blotches on Sand background and Light Grey lower surfaces. Early in 1942 the Commitee code named Organizzazione Roma (Organisation Rome) in charge for selecting aircraft to be embarked on Aquila and Sparviero carriers, proposed to build a naval version of the G.50, as a stop-gap type waiting for the selected naval fighter, the Re.2001 O/R. Modification was carried at the Air Force’s S.C.A., including also, beside tail hook and catapult attachment, a general tail structure reinforcement and some cockpit improvement. Early in February 1943, the first aircraft built were assigned to 160° Gruppo Autonomo C.T., earmarked for embarking. That unit started to be trained at Perugia S.Egidio, later failing to be embarked as no aircraft carrier entered service in time before the armistice. Fiat G.50 bis of No. 260 Squadron, Royal Air force, 1943. This aircraft retained the original green lizard Italian camouflage scheme, just adding RAF roundels on wings and fuselage, and a large fin flash extending over the whole tail area, in order to avoid any doubt about its actual proprietors. An huge white HS code characterised this squadron, operating Curtiss P-40 Kittyhawks with the Desert Air Force. The abundance of aircraft in good flying conditions found on Axis airfields appealed to many allied pilots, frequently using them both for service and, sometimes, as personal booty, as probably was the case of another G.50 bis shown in the lower profile, captured by a South African unit and, after a complete ‘sand and spinach’ repaint job (almost certainly Dark Green and Mid Stone) it displayed a wonderful sporting livery, complete with the pilot name, a certain De Moynes, on fuselage. More recently, an article of Storia Militare magazine gives a total of six aircraft lost, all by flight accidents. The Luftwaffe provided a small 17 kg armour plate for the pilot's seat. It was light in order to not overload the G.50. In addition, a life jacket and some other technical help was afforded by the Luftwaffe. "Historical Listings: Finland, (FND)." World Air Forces. Retrieved: 10 June 2011. Avions Militaires 1919-1939 - Profils et Histoire 1979, p. 118. Air International May 1988, pp. 251—252. Bignozzi, Giorgio. Aerei d'Italia (in Italian). Milan: Edizioni E.C.A., 2000. De Marchi, Italo. Macchi MC.200 "Saetta" (In Italian). Modena, Italy: Editore Stem-Mucchi, 1994. Leproni, Enrico. "I G.50 sull'Inghilterra." Storia Militare Magazine, Albertelli editions, Parma 9/08, pp. 12–15. Massimello and Apostolo 2000, p. 25. Locatelli, Daniele. "Sidi el Barrani, 14 luglio 1941. (in Italian)" Storia Militare, Albertelli editions, Parma, January 1998, pp. 31–32. Massimello and Apostolo 2000, p. 92. Malizia 2004, pp. 82–84, 85–88. Gustavsson, Håkan. "Flight Lieutenant Marmaduke Thomas St. John Pattle, D.F.C. (39029), No. 80 Squadron." surfcity.kund.dalnet.se. Retrieved: 15 October 2010. Marcon, Tullio. "Hurricane over Mediterranean." Storia militare magazine, Albertelli editions, Parma, July 2000, p. 33. Fatutta, Francesco. "La guerra d'Inverno" (in Italian). RiD Magazine, Coop Riviera Ligure, 12/1989 p. 96.
a b Arena 1996, p. 477. Mattioli, Marco. "Il G.50 nella Guerra d'Inverno" (in Italian). Aerei nella Storia magazine, Parma, January 2000, pp. 32–35. Keskinen 1977, p. inside back cover. "Finnish Fiat G.50." modelingmadness.com. REtrieved: 26 September 2010. Thompson, Jonathan W. (1963). Italian Civil and Military aircraft 1930-1945. USA: Aero Publishers Inc. ISBN 0-8168-6500-0. OCLC - 17621 63 - 17621. Marinkovic, Vlado. "Air Museum." pbase.com, 11 September 2010. Retrieved: 26 September 2010. Fiat G.50 Freccia (Arrow) Specifications. www.MilitaryFactory.com, 2009. Retrieved: 3 June 2009. Anttonen, Harri. "Fiat G.50 'Freccia'." geocities.com, Finnish Air Force Fighters 1939-1945, 2004. Retrieved: 3 June 2009.